I’m sure I would LOVE this dish and I’m definitely going to try it. My husband has an aversion to stuffed peppers but I think he was scarred by meat-heavy greasy bland things his mom used to make. 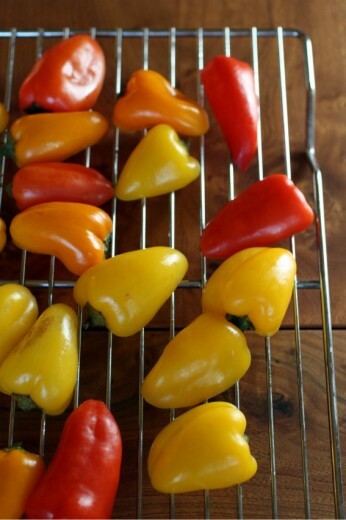 These look light and fresh and I like that you served the small peppers raw. I love Lukas’ veggie burger book, and his new book has been in my Amazon cart for a few weeks. Your endorsement was just the push I needed to click the order button! The little stuffed peppers look great! Sounds wonderful. The colors are very appetizing. I’m very inspired by all of your self- and cookbook- taught kitchen skills. I hope to teach people how to make good food someday. There is so much I want to learn and also to share. Thanks for all of your good ideas. Lukas sounds like Deborah Madison for a new generation…I’m definitely going to have to check out that cookbook! I’ve actually never been to a cooking class but I’m sure with someone like you teaching, I’d pick up on so many good tips. I can’t wait to see what your friends post! I’m giving my first cooking demo on Saturday at Williams Sonoma…any tips you have would be much appreciated! 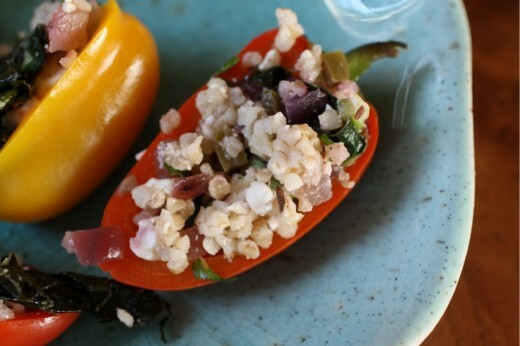 that bulgur filling sounds delicious…I’m sure I’d end up eating a ton of it out of the bowl. I really enjoy taking cooking classes as well. When I travel my explorations are usually centred around them as well. I’m always amazed by the flavor of a little char. In my case, that’s usually on chiles that end up in a sauce, but next time I’ll try it on sauteed onions too. 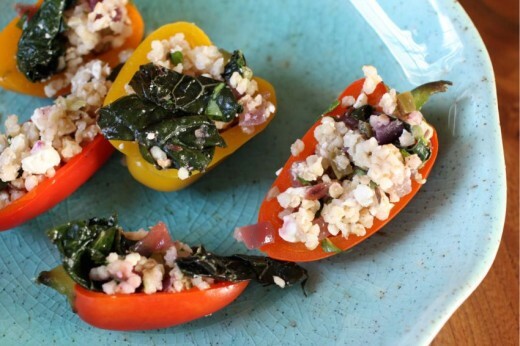 Love the kale in the salad, and it looks great in those little peppers!